Although Republican presidential candidate Donald Trump garnered more airtime, earned and paid media for the second Presidential debate, one research report said Democrat Hillary Clinton pulled in more total advertising value. Data from iQ Media said Clinton pulled in $1.63 billion from her appearance versus $1.54 billion for Trump, looking at real-time TV metrics and online media measurement technology. The company tracks real-time, live TV and online mentions and appearances -- a candidate, brand name, on-screen logo or other graphics. Clinton received 57% of all TV and online mentions (19,155) versus Trump’s 43% (14,448), according to iQ Media. When it comes to social-media interactions, Nielsen says there were 62 million pieces of social media content from 18.2 million people across Facebook and Twitter. In tweets, Trump was mentioned in 5.5 million Tweets while Hillary was mentioned in 2.1 million. 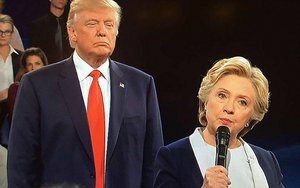 Researcher iQ Media said Trump had 65% of the total national on-air time for the debate versus Clinton’s 35% -- 7 hours and 38 minutes to 4 hours and 26 minutes -- when looking at all networks that aired the event: ABC, CBS, NBC, Fox, Univision, PBS, CNN, Telemundo, Fox News Channel and MSNBC. Trump also got 60% of the mentions when it came to paid TV (593 times) during the event and 61% of the earned TV mentions (5,377 times).